Georgia in July became the 16th state to enact a hands-free cellphone law, making it illegal to hold your phone while driving, in a move meant to put some teeth into its existing driver texting ban. in 2010, Georgia banned texting and driving, but motorists were still allowed to use their hands to dial, which critics say made the law hard to enforce. Georgia's recent legislation comes at a time when distracted driving is a major issue out on the roads. According to data from the National Highway Traffic Safety Administration (NHTSA) there were 3,450 deaths related to distracted driving in 2016. An additional 391,000 were injured due to distracted driving. Laws regarding distracted driving vary by state. While the majority of states, 47 plus D.C., have laws in place that ban texting and driving, many states still allow drivers to talk on a phone behind the wheel. Most states also have different laws that pertain to young and inexperienced drivers. Distracted driving laws can be complicated and if you receive a ticket for texting or talking behind the wheel it can impact your insurance rates. Many drivers are unaware of what exactly is legal in their own state when it comes to talking, texting and driving. We compiled the lists below to show what the law is in each state as well as the fine you can expect if you are pulled over with a phone in your hand. 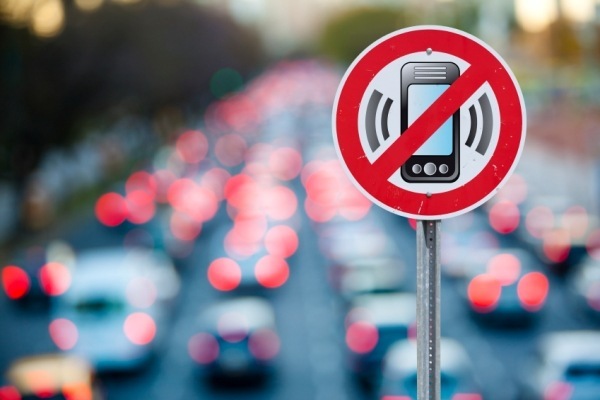 Will a cellphone ticket raise my car insurance rates? A texting ticket will raise your rates, on average, by 24 percent, according to a rate analysis showing how much insurance goes up for a texting ticket by CarInsurance.com, though it could be as low as four percent or as high as 30 percent, depending on your state laws and driving record, among other factors. "If the infraction goes on your driving record, assume you can get surcharged by insurers, raising your premium," warns Penny Gusner, consumer analyst for CarInsurance.com. "Insurers check your driving record when writing new policies, and typically every six months upon renewal, and will factor in any driving infractions using their own point system," she continues. The rate hike will vary by insurer, but in the majority of cases it would be treated as a minor violation such as a low-level speeding ticket or running a red light. "Normally a rate increase will be the same as any other first infraction," says Gusner. If you experience a sharp rate increase after a cellphone ticket, you may want to compare car insurance rates from other insurers. You'll probably find that some insurers are more forgiving than others when you shop around, she says. How many states ban texting and driving? Laws regarding cellphone use and texting vary dramatically across the country and they can be confusing. In some states there are certain cities that have stricter laws on the books than the state law, making knowing where you can and cannot use your phone a bit of a mystery. As it stands right now, in 47 states plus Washington D.C. it is illegal to text while driving. In the majority of states it is a primary law but there are a few outliers where texting and driving is only a secondary law. If the law is primary it means that a police officer can pull a driver over and issue a ticket for using a cellphone while driving. The officer does not need any other reason to pull you over, other than the cellphone violation. If the law is secondary, the police must pull a driver over for a different primary violation, as an example speeding or reckless driving. They then have the right to issue a ticket for a cellphone violation in addition to the primary offense. They cannot pull you over for a cellphone violation on its own if the law is secondary. In order to add one more layer of confusion, many states have separate restrictions that only apply to younger, inexperienced drivers. The penalties for talking and texting on a cellphone can vary dramatically between states. At one point, texting while driving in Alaska was a misdemeanor, punishable by a year in jail and a $10,000 fine for a first offender. Luckily, the fine has been scaled back in recent years and now tops out at $500 in the Last Frontier. While Alaska's fine was a bit over the top, texting or talking while driving can still be an expensive ticket in certain states. A first ticket in Oregon can result in a $1,000 ticket, which goes up to $2,500 for a second offense. On the other end of the spectrum, in Wisconsin a texting while driving ticket is a measly $20. In the majority of states, fines run between $50 and $200. Teen and novice drivers face strict cellphone restrictions in many states but the laws can vary dramatically. Some states ban cellphone use outright for anyone under the age of 18 while others only ban cellphones for drivers with a learner's permit and still others put no restrictions at all on novice drivers when it comes to using a cellphone. 0 Responses to "Cellphone laws and penalties by state"